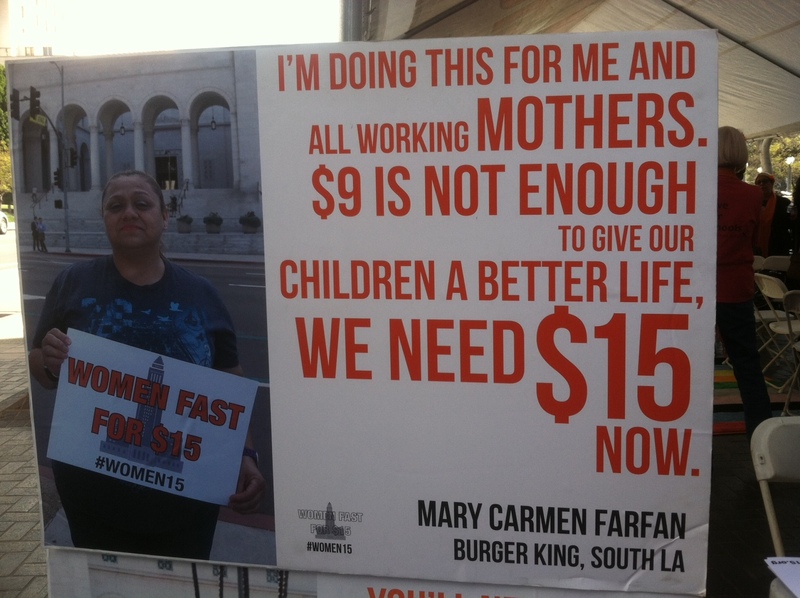 I went to City Hall this morning to support the LAWomen15 — women fasting to advocate for a $15 minimum wage. The organizers had told me I could fast today “in solidarity” with them. My husband would be skipping breakfast for a scheduled blood test, so I could be in solidarity with him, too. I thought I’d do it. I skipped my usual coffee and cereal while the kids got ready for school. I absentmindedly popped a raspberry into my mouth as I made their lunches. It’s easy to forget to fast when food is abundant. As I was about to leave for the trip downtown, something caught my eye: On the kitchen counter, half an apple glistened on wooden cutting board. It had been a small apple to begin with. I’d sliced it and put it in my son’s lunchbox, along with raspberries, a granola bar, and a slice of pizza from last night’s dinner. I considered the apple. I thought about how I’d feel stuck on a crowded freeway, my stomach empty. I could imagine its crunchy, moist, sweetness refueling my brain and body. Hunger is something so painful that if you do not have to experience it, if you have a choice, you are compelled to relieve your discomfort, to satisfy your body’s basic need. Some of the women who are fasting — full-time employees of McDonald’s and Burger King and Walmart — routinely choose between food and rent. That is NOT okay. The LAWomen15 had not eaten for 14 days. They are being heard. Mayor Garcetti came down from the tower to the street to speak to them, saying he supported their action. Some Council members did the same. Then the women, followed by clergy of all faith, solidarity fasters, and supporters like me walked into City Hall. The women addressed the Council, the people who can change their situation. They spoke eloquently. They were received with respect. They had sacrificed deeply, putting their bodies in jeopardy, to tell these sympathetic people, who had eaten breakfast and looked forward to lunch, that they needed to act with haste. I followed them out of Council chambers, and left City Hall. I walked two blocks, unapologetically knowing that food was my destination. I ordered a three dollar coffee, and felt both awe and guilt that I spent that much on empty calories that disappeared from the cup in two minutes. As I prepared to eat my gourmet sandwich, an uncommon, authentic sensation rolled through me: This called for a blessing. I took a deep breath, and exhaled a prayer of immense gratitude for the food I was about to eat. Complacency is companion to plenty. I suffer from it as much as anyone, as much as the elected officials accustomed to studies, commissions, and five-year plans. Let these valiant women’s fast create an exquisite hunger for action.